Much has been made, and appropriately so, of the importance of coral reefs in dissipating wave energy, stabilizing the shore, and safeguarding life and property in the face of storm events. Similarly, marine vegetation also plays an important role in reducing coastal erosion. 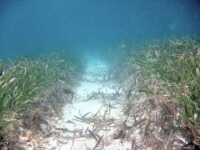 Plants create drag in the water current, which slows the current and deposits suspended particles in the seagrass bed – the result of this process is that seagrass promotes sediment-building that acts to protect the shoreline. 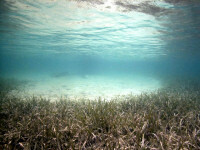 Seagrass thrives in shallow waters, where it flourishes in the presence of sunlight. Many species (including many commercially valuable fishery species) depend on seagrass, which provides nursery and foraging habitat for a large variety of juvenile fish and crustaceans. In the Caribbean, the degradation and loss of mangrove and seagrass habitats has been shown to have a significant negative impact on commercial reef fisheries. Green sea turtles feed primarily on seagrass in the Caribbean Sea, and studies indicate that the turtles have a major effect on nutrient cycling and community structure in their foraging habitats. Moreover, seagrass communities are intricately tied to coral reef systems. Sea turtles often feed on organisms that live within, or depend upon, both seagrass and coral reefs. Sea turtles also use the reef for sleep and shelter. Shallow marine ecosystems, including both coral reefs and seagrass meadows, can be greatly affected by coastal development and ocean-based recreation. Dredging, chains, anchors, propellers, even swimmers can cause damage by uprooting seagrass, scarring the seabed, reducing water quality and destabilizing sediments which, in turn, inhibits seagrass growth, reduces fish and wildlife habitat, and can threaten entire coastlines. Do not scar or remove seagrass in nearshore waters. Manage waste water to reduce effluent to the sea; for example, recycling graywater (wastewater from for sinks and showers) and using it to water grounds and landscaping helps defray freshwater use and can lower operating costs. Maintain high standards for sewage treatment, and emphasize low doses of landscape chemicals. 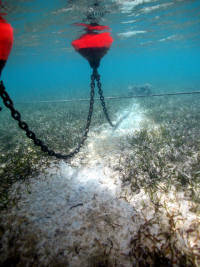 Promote limits or bans on watercraft that may damage the seagrass beds. 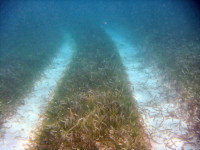 Boaters can minimize seagrass destruction by lifting their motors and drifting, poling, or trolling through shallow areas. Avoid running a boat through shallow areas, consider wind speed and direction, check tide charts and forecasts and create a float plan accordingly, use deeper water or existing marked channels as preferred access, and know the boat’s limitations for running and takeoff depths. Divers and snorkelers should practice appropriate behavior. 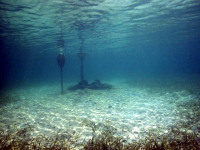 Demarcating a no-wake Swim Zone offshore the nesting beach can be a “win-win”, offering both swimmers and sensitive ecosystems a reprieve from watersports and anchoring. Ideally, all vessels should be moored. Anchoring, as needed, should be strictly relegated to non-sensitive areas.